Chains or tapes are used to measure distances on the field. A chain (see Fig. 1) is made up of connected steel segments, or links, which each measure 20 cm. Sometimes a special joint or a tally marker is attached every 5 metres. Usually, a chain has a total length of 20 metres, including one handle at each end. Measuring tapes (see Fig. 2) are made of steel, coated linen, or synthetic material. They are available in lengths of 20, 30 and 50 m. Centimetres, decimetres and metres are usually indicated on the tape. A measuring rod (see Fig. 3) is a straight lath with a length varying from 2 m to 5 m. The rod is usually marked in the same way as a measuring tape, indicating centimetres, decimetres and metres. A plumb bob is used to check if objects are vertical. 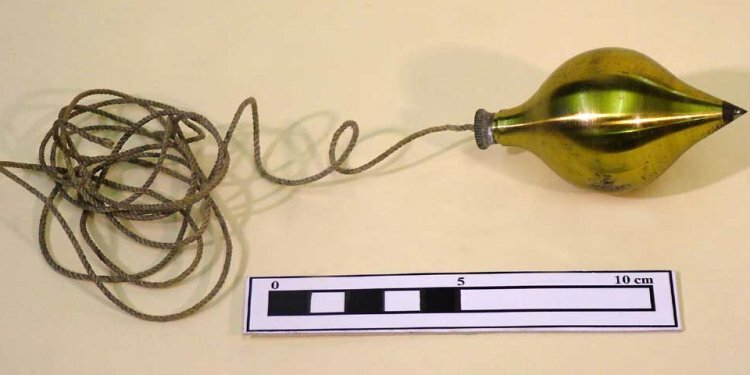 A plumb bob consists of a piece of metal (called a bob) pointing downwards, which is attached to a cord (see Fig. 4). When the plumb bob is hanging free and not moving, the cord is vertical. A carpenter level is used to check if objects are horizontal or vertical. Within a carpenter level there are one or more curved glass tubes, called level tubes (see Fig. 5). Each tube is sealed and partially filled with a liquid (water, oil or paraffin). The remaining space is air, visible as a bubble (see Fig. 6). On the glass tube there are two marks. Only when the carpenter level is horizontal (or vertical) is the air bubble exactly between these two marks (see Fig. 6). Ranging poles (see Fig. 7) are used to mark areas and to set out straight lines on the field. They are also used to mark points which must be seen from a distance, in which case a flag may be attached to improve the visibility. Ranging poles are straight round stalks, 3 to 4 cm thick and about 2 m long. They are made of wood or metal. Ranging poles can also be home made from strong straight bamboo or tree branches. REMEMBER: Ranging poles may never be curved. Ranging poles are usually painted with alternate red-white or black-white bands. If possible, wooden ranging poles are reinforced at the bottom end by metal points. Pegs (see Fig. 8) are used when certain points on the field require more permanent marking. Pegs are generally made of wood; sometimes pieces of tree-branches, properly sharpened, are good enough. The size of the pegs (40 to 60 cm) depends on the type of survey work they are used for and the type of soil they have to be driven in. The pegs should be driven vertically into the soil and the top should be clearly visible.